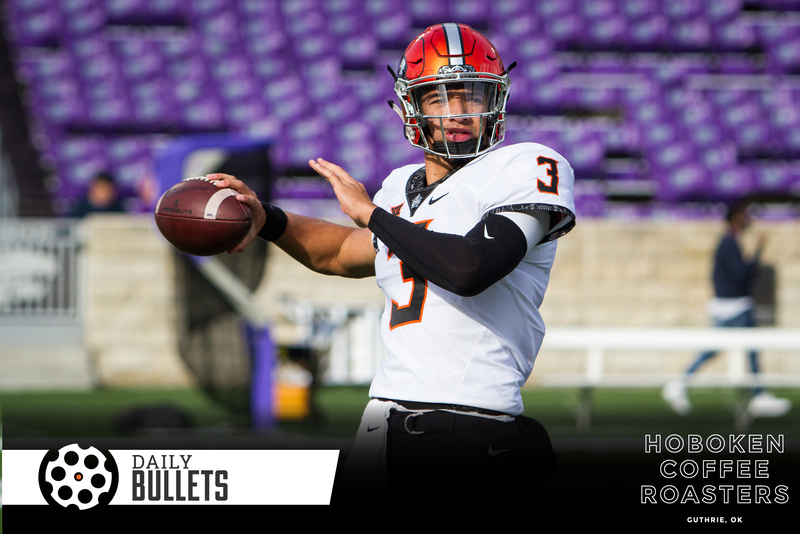 Daily Bullets (Feb. 12): Gundy’s Solid Off Season, Blooming QB Run Game? With this eight to ten games left, I’d love to see some wing dominance – give me a handful of 25, 30 point games from Cam McGriff, Lindy Waters or Curtis Jones and you can package some optimism to go with the next recruiting class. • OSU headed toward a QB run game? • OSU hired Kansas State’s offensive line coach and a coordinator fond of running a quarterback in clever ways. I wonder where this is headed? Would you be surprised if we ran Spencer Sanders 10 times a game for the first half of the season? • Boone nails it here – Gundy could be swinging an off-season from a depressing “we lost two coaches to lateral moves” to improving the team. • After asking a friend what a big difference between Boynton teams and Ford teams are, he had this nugget: Mike Boynton found a center in year two. • I don’t love reading it but some football minds still need to be sold on the superior capabilities of Dallas Cowboy Blake Jarwin. • Loved this weight loss story about Yor Anei and Kentrevious Jones from the weekend – the John Smith quote was all-time. It was (John) Smith, considered one of the greatest wrestlers in American history. He had (Anei and Jones) wear sweatpants and trash bags and told them to sit in the team sauna before running laps. • Saw a great quote about Dabo Swinney and how he strategically built Clemson. Sign me up when that guy writes a book. • Good read on the new free agency in college football.